First off what is a Responsive website? So what does that mean for a website? What it means is that the site is automatically scaled to fit whatever device the browser is using. Give it a try with the site I did for Clive Baker. Open any site and scale the window you are using to see how the site views. The forecasts for 2013 in terms of sales means that fewer laptops are going to be sold compared to the previous year. Sales of tablets and smartphones are still soaring. I know that when I look at analytics of a website for Ski Breezy, a Catered Chalet in Chamonix, 30% of traffic is from Tablets. For existing WordPress sites it is fairly easy to find a new theme and activate it. 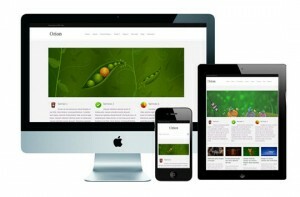 My guess is that the volume of Responsive themes available will also increase this coming year. I am definitely going to start a collection of nice Responsive themes to play with for different websites. I think that there are loads of people out there who are going to revamp their old sites with a fresh look to suit the new era of Tablets and Smartphones.